Fatigued to Fantastic! End Pain - Part of Dr Teitlebaum's From Fatigued to Fantastic! line of products - Contains Sweet Cherry Fruit Extract, Boswellia Serrata Gum Resin Extract and Willow Bark Extract. RECOMMENDED USE: Take 1 tablet three times daily. May increase to 2 tablets three times daily, if needed for additional support. Though relief will be noted immediately, continued use may be needed to achieve maximum effects. This product contains NO: gluten, salt, sugar, yeast,wheat, dairy products, artificial flavoring or preservatives. Do not use this product if pregnant or nursing. Do not use if you have an ulcer or are allergic to, or have contraindications to aspirin or other salicylates. If taking blood-thinning or any other medications, consult a healthcare professional before use. Discontinue use two weeks prior to surgery or if stomach upset occurs. Keep out of reach of children. 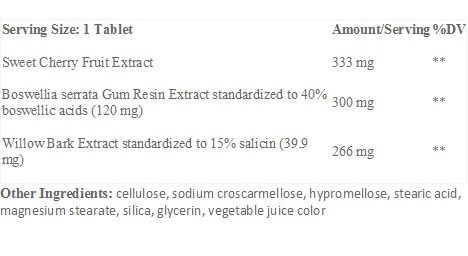 This product also contains: cellulose, sodium croscarmellose, hypromellose, stearic acid, magnesium stearate, silica, glycerine, vegetable juice color.